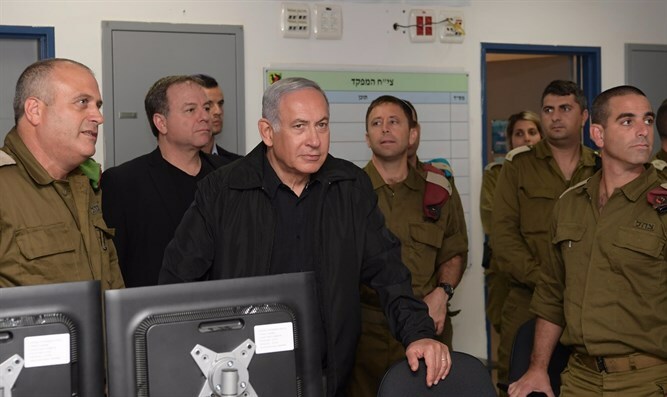 Prime Minister Binyamin Netanyahu held a security assessment in the Gaza Division on Wednesday afternoon, with the participation of the defense minister, the deputy chief of staff, the head of the National Security Council, the head of the Shin Bet and senior security officials. Afterward, the prime minister met with heads of local authorities in the Gaza vicinity. Prime Minister Netanyahu said at the end of the security assessment that "Israel views with great severity the attacks on it along the fence, in the Gaza vicinity, on Be'er Sheva - everywhere. I said at the beginning of this week's cabinet meeting that if these attacks do not stop, we will stop them. I want to tell you today - Israel will act with great force." The Prime Minister toured the headquarters of the Gaza Division, where he met the IDF lookouts who identified the rocket launching squad that had been thwarted by the IDF and expressed appreciation for the work of the Gaza Division headquarters. At the end of the tour of the Gaza Division, the Prime Minister met with regional council heads in the Gaza vicinity: Tamir Idan, head of the Sdot Negev Regional Regional Council; Alon Davidi, mayor of Sderot; Yair Farjun, head of Hof Ashkelon Regional Council; Alon Shuster, head of Shaar Hanegev Council; and Gadi Yarkoni, head of Eshkol Regional Council. The political-security cabinet will convene today at 7 pm to discuss the tension in the Gaza Strip, which escalated overnight after rockets were fired into Israeli territory. One of them, launched towards the sea, fell off the coast of Gush Dan. Another rocket hit a residential building in Be'er Sheva. The family members, who suffered from anxiety, were saved a few moments after the mother rushed her children with her into a bomb shelter.